Since ancient times, livestock farms have provided us with eggs, honey, meat, milk and other produce. Moreover, the skins and the hair of these animals have been used to make blankets, clothing and shoes. The word “Livestock” refers to domesticated animals raised in an agricultural setting to produce labor and commodities. Traditionally farms are used to raise cattle or dairy cows, chickens, goats, pigs, horses and sheep. Nowadays, livestock farming is still the rearing of animals for food and for other purposes, but the farmers are constantly concerned about improving the methods of breeding. In present days even animals like mules, donkeys, rabbits and insects such as bees are being raised as part of livestock farming. Sheep are often known by their Latin name Ovis Aries and their raising plays a major role for the any economy. For this reason, for centuries, humans have been improving this activity in order to increase the quality of their breeding traits. Domestication of the animals was part of the most important events in human history. Some of the evidence suggests that sheep were domesticated in 8000 BC in South-West of Asia, but they were discovered long before. It is often said that the ancestor of the modern sheep is the wild mouflon (Ovis Orientalis) which used to live in Mesopotamia. In Romania, the wool production played an important role in sheep-raising from 1950 to 1989. At the time, wool was the main production objective of the Tigai breed raising. 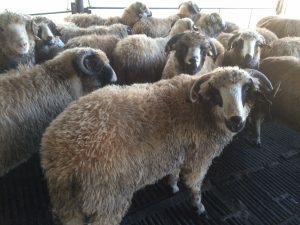 Socio-political changes and economic reforms that have taken place in Romania after `89 had caused significant changes in the growth and exploitation of sheep flocks, so the wool is no longer so important today. Between 1992 and 1993 greasy wool production in Eastern Europe was 80,000 tonnes, of which 34% alone was produced in Romania (Barrett et al., 1993). However, demand for wool production still exists, so per client`s request, Romanian company Seradria delivers sheep with or without wool. The Turcana breed is the most impor­tant sheep breed in Romania, with about 70 percent of the market. It is a multi-purpose breed raised for milk, meat and wool production. Because the breed is very well adapted to the alpine pasture, the Turcana Sheep is also called “The Queen of the Mountains”, “Mountain peasant” or “Valachian sheep”. Lamb meat contains many vital nutrients such as iron, zinc, selenium and vitamin B12. Furthermore, it is well-known that this type of red meat is an excellent source of protein. Even though the red meat has sometimes a bad reputation and many people avoid consuming it because this would raise the blood level of cholesterol and therefore increase the risk of heart disease. Many doctors say that our body needs 200 milligrams of cholesterol every day. Even though lamb is high in cholesterol, beef is even higher. Still, there are many specialists saying the opposite. Also, the meat lamb is tender and is more digestible than the beef. In other words, you’ll have to keep in mind that beef isn’t so rich in nutritional components (for example proteins) as lamb meat. As a matter of fact, if you eat lamb with moderation, you’ll have the chance to maintain a well-adjusted level of cholesterol. Lamb meat consists of higher percentages of iron when compared to chicken. There are two forms of iron: heme iron and non-heme iron. The first one can mostly be found in red meat, while the other one can be discovered in vegetarian food. Many doctors recommend the consumption of lamb because the heme iron is more absorbable than its non-heme variant. 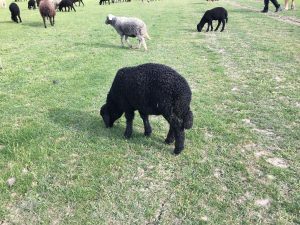 The Karakul is one of the most well-known sheep breeds in the world and highly appreciated by breeders with a tradition in livestock and sheep meat consumption, as well as in the fashion industry. Karakul sheep belongs to the fat-tailed or fat-rumped group of breeds that is characterised by the fat deposit at the base of the tail rather than elsewhere in the carcass. This fat has a distinctive texture and flavour that are highly valued in central Asian cuisine and others! The Karakul sheep is a wool-producing breed as well! Besides their good quality meat, the Karakul is also considered a wool sheep still raised for the pelts of new-born lambs. After official negotiations between the sanitary veterinary authorities from both countries, Romanian livestock companies can now export lambs and cattle to Turkey starting from January of 2017. There are now sanitary certificates for trading sheep and bulls for both breeding and immediate slaughtering that can be used for making the export. Our company Seradria works with Turcana traditional breed of sheep, which has a good ratio of meat upon slaughtering. We can prepare large numbers quickly, with a few thousands always on stock, ready for delivery. For cattle we usually work with Simmental breed as it is the most widespread in Romania. 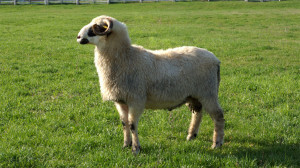 We can also offer other meat breeds such as Blue Belgium, Charolais and Limousine, but in fewer quantities. We can export bulls for breeding (150-250kg) as well as for immediate slaughtering (300-600kg). Transport is made by truck. Breeding sheep and cattle is a traditional business in Romania, with companies having an extensive expertise in raising, fattening and trading various sheep and cattle breeds. The animals are raised in a complete natural, healthy environment. They are also treated from a sanitary veterinary perspective, as per EU regulations in force. We can now export lambs and cattle to Israel. The official sanitary veterinary certificate has been ratified a few months ago which allows the Israeli market to import sheep from Romania. We can prepare the lambs specifically for Israel which means all should be males, castrated and with all required blood tests and vaccines required by Israeli sanitary veterinary authorities. Depending on the cold or warm season we will need to keep the lambs in our quarantine from 30 to 60 days after castration and vaccination and prior to export. We can offer shipping to Haifa port in Israel or Eilat port for Palestine. Sanitary Veterinary authorities in Lebanon have reopened the market for imports of livestock from Romania. After a few months of interdiction, Romanian sanitary veterinary authorities have had a few official meetings with their Lebanese counterparts in order to draft a new sanitary veterinary certificate. The new agreement is now shorter and more concise, with the exact specifications and conditions that must be met in order for a livestock company from Lebanon to be able to import sheep and cattle of Romanian origin. Seradria has prepared all necessary documentation and can export lambs and bulls to Lebanon as of today. The lambs have an average weight of more than 25 kg/head and are from 2015. The Simmental cattle that we mainly work with has a range of 200-600 kg/head. Each cattle has its own passport for good traceability and all sanitary veterinary treatments done. We can export livestock for both breeding and slaughter. After a few months of closure the Libyan market for livestock is now open to import lambs and cattle from Romania. After several official meetings between Libyan and Romanian sanitary veterinary authorities, an official agreement has been put in place that allows companies in Libya to start again the imports of livestock from Romania. The new sanitary veterinary certificate is official and can be used to approve the new exports, for both sheep and bulls. As always, Seradria has been preparing for this moment and is ready to deliver high quality lambs, ready for slaughtering upon arrival in Libya. We have few lambs left from last year at weights between 45 and 55 kg per head. Starting from April we will be able to offer new lambs from 2015 which have a weight of around 25+kg per head. 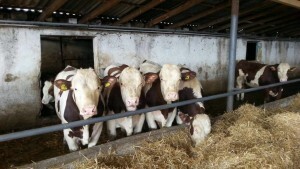 We have already started to prepare Simmental bulls for sale to the Libyan market. These bulls are very good in terms of the meat/weight ratio at slaughtering and can take the trip to Libya very well. We have cattle with weights starting from 200kg per head and up to 600kg per head, all with individual passports for good traceability and all sanitary veterinary treatments done.